Today we accept as normal the constant harassment of the federal government, and confiscation of personal property far beyond anything King George could have enacted or imagined. Our acceptance of it is our Declaration of Dependence—dependence on government invasion and coercion. What our founders fought to free themselves from, the vast majority today fights to keep. The dark force behind socialism is the public’s demand for and dependence upon government handouts. They not only demand them they stand in the way of anyone who tries to eliminate them. The only way to reverse this trend is for those who are truly conservative to stand up and say no more government handouts of any kind. We need to ween ourselves off the teets of the federal government. We have to stop looking for the tyrannical state to come to our aid. We have to once again call upon the providence of God and as a free people we need to learn to live like it, or we will be forever enslaved to the tyrannical rule of the government, which will grow exceedingly large under each successive reincarnation until the entire weight of it comes crashing down upon our heads. We have no one to blame but ourselves as these studies show. Although 40% say they are conservative, there is no proof of those same 40% holding any real conservative convictions when it comes to socialism. 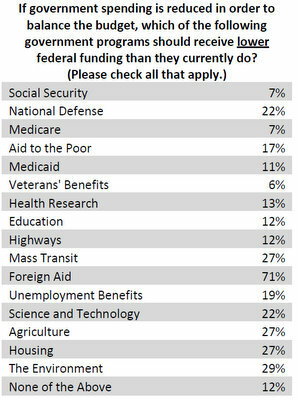 They, along with the rest of America, still wish to receive government handouts. This is “A View from the Nest” what say you? I am a Conservative Christian Patriot in our Judeo-Christian Nation United States of America!! I think the time has come when the old labels of “Republican” and “Democrat” are outdated and essentially useless. Under the rhetoric, neither party seems to get anything done. Remember Pelosi stating the the healthcare bill had to be passed before we’d find out what it’d do? Or the Republican held Congress being unable to accomplish anything because as the Senate Majority leader said, “we can’t pass the bill because Obama will just veto it? The time has come to for all of us to decide where we each stand……Conservative or Liberal. Faith-family-honor or the road to destruction. I agree but since our Constitution has established a representative Republic it is our duty to select those who we wish to represent us. Unfortunately, the process and the Constitution has become so bastardized that the people are no longer represented by those we supposedly elect to do just that. Instead, we find that the representatives represent the ones who have the deepest pockets and can afford to BUY INFLUENCE. This is not what the founders had in mind when they gave us our Republic; it is however what we have allowed by placing way too much faith and confidence in a central federal government. Thank you for taking the time to stop by and leave me your thoughts. Do come back again.